There’s a whisper among the whiskered: the end of the beard may well be upon us. 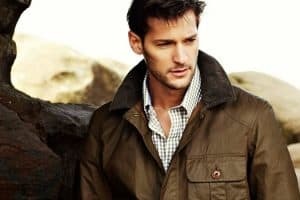 Men have realised the lumberjack look is not nearly as low-maintenance as we’ve been led to believe and a clean-shaven face is now being championed as much on the red carpet as it is in the boardroom. For that reason, shaving cream is on the rise. Very much in keeping with the trend for a traditional barbershop experience, shaving creams are a good mix of old and new. There’s the old-fashioned feels of knowing your grandad did it this way, while also getting modern, moisturising ingredients for a close shave that won’t leave third-degree razor burns all over your neck. A-listers don’t need convincing. Dave Franco, the better behaved brother of James who is quietly becoming one of Hollywood’s most stylish men, has long been a champion of the clean-shaven look. It’s no coincidence that he doesn’t appear a day over 25. The same goes for smoothly-does-it actor Armie Hammer or British model Oliver Cheshire. When it comes to shaving, trends have been moving at pace. It doesn’t seem like such a long time ago that the options were strictly limited to a can of expanding foam from the local drug store. But in the years since beards resprouted on the face of normal men, male grooming has experienced something of a boom. A glance down the shaving aisle throws up a multitude of gels, foams, soaps, clays and serums. So why choose shaving cream? The benefits of shaving creams are easy to understand. It’s in the name: cream. It sounds gentle and is gentle, which is exactly what you need when you’re scraping a sharp blade around your face. Anything including essential oils, like sandalwood and eucalyptus, will be gentle on the skin and smell far more pleasant than a chemically enhanced product. It’s also best to consider finding a brand that doesn’t include parabens or glycerine in their ingredients list. Parabens are basically preservatives – we’re all trying to omit them from our diet, so why smear them on your skin? And glycerine simply dries the skin out – not what you want when there’s a razor blade in the vicinity. Shaving creams are better for a clean shaven look than shaving around a defined facial hair style. A gel is better if you‘re engaged in topiary around a moustache or beard because it lets you see what you’re doing. With a cream, you’ve got the opportunity to give yourself a classic appearance with some pretty vintage tools. Using a shaving brush will not only evoke memories of watching your father shave, but also ensure the shaving cream is evenly and gently applied. “I’d recommend applying them with a shaving brush (and using a shaving bowl),” says Luigi Caterino, head of shaving training at The Bluebeards Revenge. If you’re hesitant to shell out on a brush, using your own clean hands works pretty well too, but don’t be too rough. It’s all about careful and gentle application. Once you’ve secured the perfect brush for you, hold it under hot water, making sure the bristles are well soaked. Use a small amount of your chosen shaving cream and add it to your brush or fingers, then apply to your face and neck using a gentle circular motion, until a good lather is created. Finally, shave goodbye to your winter layer. High-street prices and simple formulations have made Nivea a go-to provider of no-fuss grooming products which are also kind to sensitive skin. 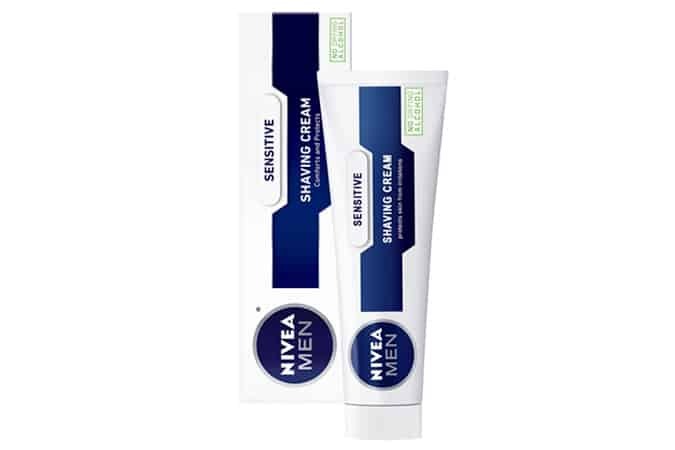 Nivea is a great starter product if you’ve never used shaving cream before – it’s inexpensive and, because of the marine minerals and vitamins included in the ingredients, you won’t have to deal with shaving rash on the commute to work. This high-end grooming store stocks luxury traditional products from high-end brands, as well as producing their own shaving products. Its formula is free from parabens and includes prickly pear oil, which offers increased moisturisation and anti-ageing qualities as well as a citrus fragrance that will help to wake you up in front of the bathroom mirror. Aside from the fact it’ll look awesome on your bathroom shelf, Italian brand Proraso is a well-established barbershop favourite that’s been on the market since 1948. Its shaving cream combines cypress, cedarwood and vetiver for a subtle, manly overall scent. No parabens, no stubble rash, but plenty of old-school dapper gentleman charm. This British Master Barber-approved brand has an answer for pretty much every shaving problem going: stubborn stubble, dry skin, and coarse beard hair that just won’t conform. The award-winning company runs its own training schools as well as producing its own range of hair and shaving products. And if they’re good enough for the pros, they’re fine for the rest of us. Cosmetic giant Clinique made its name with good-quality skincare products that go easy on the dermis. Its cream is more expensive than the average high-street options, but it feels it on the skin. A genuinely creamy cream, it moisturises while also lifting the hairs – making for a clean and comfortable shave. If a premium, award-winning product is what you’re after, Baxter of California is a fashionable choice that will look as good on the bathroom shelf as it feels on your skin. The company has been helping groomsmen since the sixties and promises to guard against red shaving rashes and the chances of nicks. Its shave cream includes antiseptic tea tree oil to help soothe your skin. This British-made brand is best known for its innovation in razors, which has seen it challenge the mighty Gillette for Britain’s most popular blades. King of Shaves even tried to cut shaving cream out of the equation entirely with its dry shave Hyperglide razor. But the company still produces a range of shaving creams and gels (the world isn’t quite ready for dry shaving, it seems). Best of the lot is the 2-in-1 No Foam Shave Cream + Daily Moisturiser, a two-in-one product that won’t leave you raw. Family-owned company Jack Black is serious about looking after men’s skin – no fuss, no cosmetics, just straight-up no-nonsense skincare products. The company also prides itself on using the best possible ingredients across its entire range. For a great shaving cream, try its trademark Supreme Cream Shave Lather, which uses ‘Triple Cushion’ technology: a triple whammy of macadamia nut oil, glycerin and soybean oil to cushion the skin and protect against razor burn, irritation and nicks and cuts. Cornerstone has one goal – to create the best possible shaving experience. It’s no surprise, then, that its products are alcohol-free, BPA-free, paraben-free and contain no plastic microbeads (they’re also environmentally friendly, in case you’re the type who finds their conscience peering back at them in the mirror during the morning shave). The subscription company’s shaving cream combines a blend of bamboo and willow bark to create a rich, thick lather, while the willow bark has natural anti-inflammatory properties to also tackle irritation. Producers of premium, elegantly British grooming products, Taylor has been in business since 1854. It has a reputation for using high-quality botanical extracts in its products and offers traditional wet shaves at its Jermyn Street barber shop (a bit like getting a shave in Victorian London). The brand also produces a range of excellent shaving creams, including sandalwood, rose, and coconut variations, along with options for sensitive skin. Billy Jealousy is about looking sharp by cleansing and bringing out the health, texture and tone of your skin. It’s big on scientific research too, using raw materials to create its cutting edge products, each blended from up to 20 ingredients. The company’s award-winning Hydroplane Shave Cream is technologically advanced (as far as shaving creams go) and entirely foamless, allowing for a slick, easy shave. It’s also a great all-rounder – a pre-shave oil, cream and moisturiser all in one. 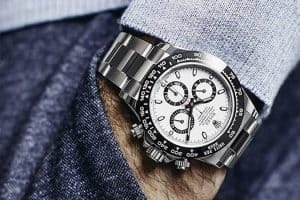 It sounds a bit aggressive, but Bulldog’s bark is much worse than its bite – the company’s products are deceptively sensitive. Packed with natural ingredients, they’re purpose built to tackle the skincare problems that are specific to men, whether that means oily, dry or rough and rugged skin. The brand’s shave cream contains aloe vera, camelina oil and green tea – great for hydrating and helping the razor glide across your face. The Art of Shaving is all about classic products and shaving techniques for modern men (they even have in-house master barbers who can provide you with a personalised shaving plan). It’s not just about what the product is, but how you use it – and its Unscented Shaving Cream comes with specific instructions on how to achieve the best shave possible. Made with coconut acid for absolute smoothness, the cream creates a rich foamy lather to hydrate, soften hairs and reduce irritation. Lab Series has been making dedicated men’s skincare products for over 30 years. Understanding the difference between men’s and women’s skin, it tailors products specifically to men’s skincare needs: anti-ageing, razor burn and sun protection are all covered. The brand also prides itself on combined formulas that tackle more than one skincare problem at once. Its Cooling Shave Cream has a high-glide, low-impact formula that cushions the skin while ensuring a close, clean shave.